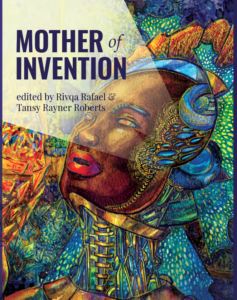 A sneak peek of the cover for Mother of Invention edited by Rivqa Rafael and Tansy Rayner Roberts. This stunning artwork and design is by Likain. The hardback edition of this anthology is at the printers. It is an exclusive edition to our Kickstarter backers and will begin shipping out to them shortly. If you missed out on the Kickstarter, there will be a paperback and ebook edition out in September.